IN his continuing search for the more weird, wacky and wonderous in the world of travel, David Ellis finds South Africa's postal service actually began 150 years before European settlement of the country – and that the first letter "posted" there was literally given the boot. It was back in 1500 when ships of many nations were stopping off in what is now South Africa to take-on water and whatever food they could barter, that a Portuguese bloke came up with the idea of putting mail for delivery back home in an old seaman's boot under a tree in what is now Mossel Bay; ships heading in the opposite direction would clear the boot and deliver its contents to the countries to which it was addressed. The first letter was left this way by Pedro de Aitade, a naval commander, who addressed it to the King of Portugal. It was found over a year later in the boot by the Third East India Fleet, and doing the right thing, they had it delivered to Portugal and the King. 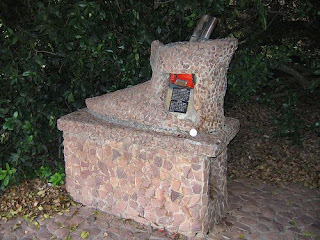 Today a large stone replica of the original boot stands on de Aitade's original boot site – 510 years after he left the first letter there in 1500 – and mail posted in this boot-shaped Post Box is franked "Post Office Tree Mossel Bay."